As Pipe Acquisition Disorder (PAD) takes over, one rapidly discovers that unless you want to just throw your pipes into a box, they take up a fair amount of room. 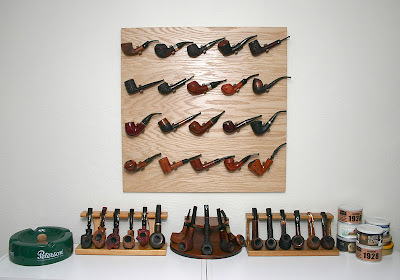 In an effort to streamline my life a little and de-clutter the house, over the years I have sold or given away probably two dozen pipes. What remains are the ones that either have sentimental value or are truly good smokers and ones I want to hang onto. The office was getting way to cluttered for my liking, as well as Paula's, so instead of purging another quantity of pipes - shudder! - I decided to go vertical. The horizontal surfaces in the office, i.e. the tops of bookshelves, were too full of pipe racks which aren't really an efficient storage method. They showcase the pipes nicely, but there seems to be too much rack and not enough pipe. I decided I needed a board and a quantity of rubber pipe clips and thanks to some folks at Smokers Forums, I located a couple sources. I mentioned my little project to Lou at The Tobacco Hut and he said he had dozens that he wasn't using. He then graciously volunteered to make the board for me, as he had the perfect size board left over from another project of his. In just a few days he had it completed and it now hangs on my wall above the shelf with my other racks. I was able to retire a few pipe racks to the closet but when PAD kicks in again, I'll be ready. I guess in a couple years I might be asking Lou to build me a whole pipe cabinet! Cheers - and thank you Lou!